This gourmet DaVinci flavour is a classic and a favourite by many. Vanilla is a real crowd pleaser and works fantastically in so many recipes. Taste authentic sweet vanilla with no artificial flavours or colours. 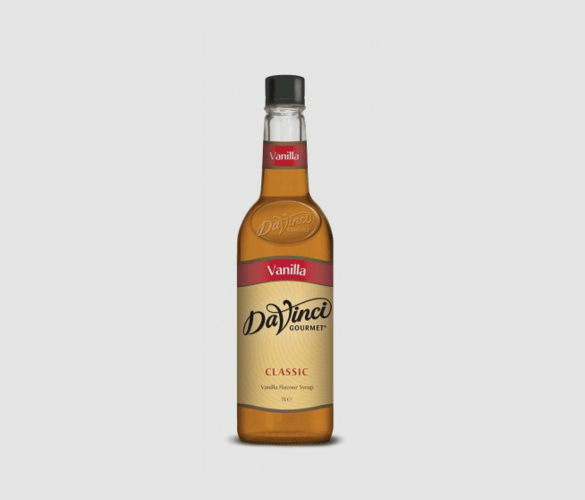 Experience pure extracted vanilla beans in this delightful syrup. Experiment with different flavour combinations as vanilla is delicious in a wide variety of drinks. DaVinci prides itself on only using the highest quality ingredients, which makes these products stand out from the crowd. Coffee – The subtly sweet taste gives a delicious and unique flavour to coffee without over powering it. Tea – Vanilla is such an easy ingredient to pair with other flavours. Keep it simple by just adding a little to your English breakfast tea instead of sugar, or be bold and try different fruit and herbal teas. Cocktails – This is an easy way to add that professional touch to your cocktail recipes. Smoothies – Vanilla is delicious when paired with fruit, so start with a little drop and see how much sweetness you would like in your smoothies. Desserts – Ice cream, cake, brownies, whipped cream, fruit pies and much more. This syrup is a special ingredient that will make you desserts all the more irresistible. This product works in all kinds of coffee, cappuccinos, lattes, americanos and more. One drop goes a long way in a coffee so we recommend starting with a little. You don’t have to limit your flavour experience to just one syrup, why not try exciting combinations. Have a look at our full range of syrups to get inspired for delicious flavour pairings. Here is one of our favourite recipes using this flavour. It is a super easy way to re-create a coffee shop standard beverage in the comfort of your own home. Mix together both syrups with the espresso. If you don’t have a steamer at home, you can froth the milk by shaking it vigorously in a cup with a lid on and then putting in the microwave for a few seconds to stabilise the foam. Pour the milk into the mug with the espresso and syrup. Garnish however you like. We love to top with whipped cream, chocolate sprinkles and an extra drizzle of syrup.